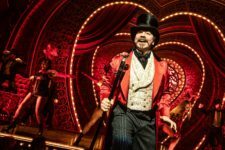 Ben Brantley of Ye New Yorke Times has posted a rave about “Moulin Rouge! The Musical,” which has opened in Boston. The show is based on the 2001 movie starring Kidman, McGregor, and Jim Broadbent. The Broadbent role in Boston is played by my old pal Danny Burstein (pictured). Can’t wait to see him and the show. “Anna Karenina”: A Contender After All?